Introduction P.Schmidt Consultancy services B.V.
P.Schmidt Consultancy Services was founded in 2001 with the intention of ever starting for myself. At the end of 2006, this moment emerged and from then on I have completed several interim assignments in the IT / Telecom sector. Some of these interim roles were in the procurement area, where I acquainted myself with two services that you will find on my Web-site. The first service is about E-Tender and E-Auction using Marketdojo’s SAAS solution. First of all, these services are interesting because they not only make a lot of money for the companies that make use of them, but they are also pleasant to use, because of the ease and speed by which the efficiency within the procurement department is attained. An element of excitement can be found in the E-Auction service, which shows the negotiation process in real-time, that makes it extremely exciting for all the participants to see who comes up as the winner. A second phenomenon that interests me is the Public Cloud and the enormous changes that go along with the adoption of the Public Cloud. 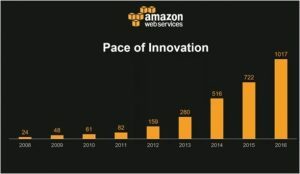 I do focus on Amazon Web Services because they are the market leader and with more than 1000 innovations in 2016, the most versatile Public Cloud Provider to follow. See also the graph below, which clearly shows the acceleration of releasing new features. Cost control of the cloud. The Cloud in itself offers a myriad of services to the Business community, which brought me to focus on cost governance. The idea behind this service is to create an awareness of the cost among the Business leaders by explaining how the cost model works and what practices exist to control these costs. If there is no process the costs may very well increase with may ultimately lead to an unexpected “bill shock”. By initially channeling this awareness process within your company, costs can be brought under control and presented to the business leaders in a predictable manner. The Cloud Business Case Design Service examines not only the financial aspects of the introduction of the Cloud but also takes a close look at the benefits and how challenges can be mitigated, which in essence can differ per industry. The Business Case design also serves as important document in the journey to the Cloud. Demo Artificial Intelligence from the Cloud. 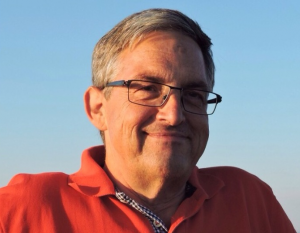 Peter Schmidt has a long-standing position in the Telecom industry where he has focused on managed services. With the advent of the public cloud, he quickly became qualified in Cloud Computing at Business level. He specializes in cost optimization for the AWS Cloud as well as preparing customers for the journey to the cloud. He is in possession of an AWS partner certificate TCO & Cloud economics.